South Africans are heavily indebted, as we all very well know. In order to make a dent in the debt it sometimes requires that we get creative in the way that we manage our finances and debt. With South African household debt as a ratio compared to disposable income at 74.6% we as consumers have no other choice but to start thinking about ways to reduce the debt burden. Not only do we need to find ways to manage our debt and finances better, but we also need a way to become more aware of what we spend and what we spend it on. Many consumers are completely unaware of what exactly they spend their money on a day to day basis. they are also unaware of the cost of things, rounding amounts off in their minds. A Spending Freeze can be a creative way to make a dent in consumer debt and also help consumers to become aware of what they are spending their cash on. 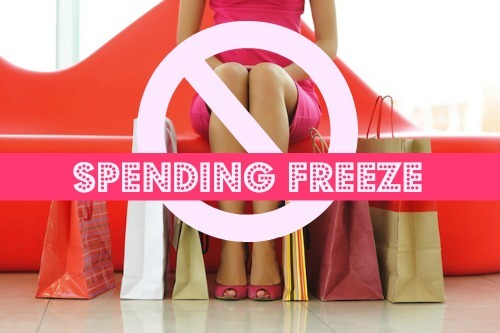 A spending freeze is essentially a period of time in which someone stops any discretionary spending, often for one or two weeks. Spending freezes have been gaining in popularity around the world – even being used in a number of consumer education programmes that help people to get out of debt. While it is not a long term solution; it enables people to really take a close look at their finances to see where they are spending money and where they can realistically cut back. Before you embark on any spending freeze, you must take an accurate look at your finances. Work out where you are spending money each month and where you can cut back. By doing this, you can separate the items that you ‘need’ to buy from those that you ‘want’ to buy. Then revise your budget to only account for those items that you need and you’ll see how much you can save in just a few weeks. Check your cupboards and your freezer and see what foods you are likely to need. If you already have lots of pasta and rice then aim to use this up during the time rather than shelling out on even more foods. It may be advisable to set a small portion of money aside to purchase perishables such as milk and vegetables. At the end of the two week period you will have saved a certain amount of money, so decide what you are going to do with this before you start. This could mean putting it into your savings or paying off some of your debt. Fill your tank with petrol so you’re not tempted to go and spend money at the service station – and consider filling an extra can if you need more than one tank over two weeks. It is also advisable to pay all of your bills before the Spending Freeze so that you are not tempted to spend anything extra.